The rooms of Club Afrodit Tatil Köyü include satellite TV, minibar and free Wi-Fi. All rooms have a private bathroom with a hairdryer and free toiletries. 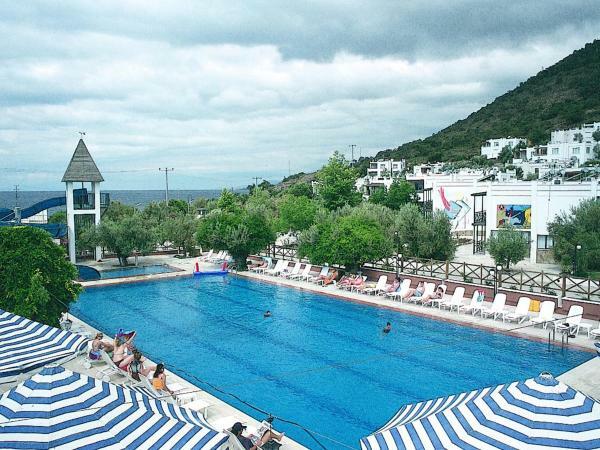 Located in a complex only a few steps from the sea, Club Afrodit Tatil Köyü has a private blue flag beach. Surrounded by olive trees, the property has an outdoor pool,children pool, water-slides, sun terrace, fitness centre, children's playground and 4 tennis courts. Altinoluk town centre is 6 km from Club Afrodit Tatil Köyü. You can access the beach through the underpass. Balıkesir-Koca Seyit Airport is 30 km away. The restaurant offers à la carte and buffet dining options. You can enjoy healthy dishes prepared with organic products from Club Afrodit’s own garden and olive oil produced by the property. This double room has a TV, minibar and air conditioning. Room facilities: Minibar, Shower, Safety Deposit Box, TV, Telephone, Air conditioning, Hairdryer, Free toiletries, Toilet, Bathroom, Heating, Slippers, Satellite Channels, Interconnected room(s) available, Tile/Marble floor, View, Wake-up service, Mosquito net, Wardrobe/Closet, Towels, Linen Can you tell us what you'd like to see here? This quadruple room has a tile/marble floor, air conditioning and minibar. It also has a large balcony. Room facilities: Minibar, Shower, Safety Deposit Box, TV, Telephone, Air conditioning, Hairdryer, Free toiletries, Toilet, Bathroom, Heating, Slippers, Satellite Channels, Kitchen, Tile/Marble floor, View, Wake-up service, Mosquito net, Wardrobe/Closet, Towels, Linen Can you tell us what you'd like to see here? This 2-bedroom suite includes a living room with a satellite TV and minibar and a private bathroom. It also has a kitchen. Room facilities: Minibar, Shower, Safety Deposit Box, TV, Telephone, Air conditioning, Hairdryer, Refrigerator, Seating Area, Free toiletries, Toilet, Washing Machine, Bathroom, Heating, Slippers, Satellite Channels, Kitchen, Fireplace, Private entrance, Sofa, Tile/Marble floor, View, Wake-up service, Electric kettle, Kitchenware, Mosquito net, Wardrobe/Closet, Oven, Stovetop, Barbecue, Towels, Linen Can you tell us what you'd like to see here? This apartment has a stovetop, seating area and minibar. Apartment facilities: Minibar, Shower, Safety Deposit Box, TV, Telephone, Air conditioning, Hairdryer, Refrigerator, Seating Area, Free toiletries, Toilet, Washing Machine, Bathroom, Heating, Slippers, Satellite Channels, Kitchen, Fireplace, Sofa, Tile/Marble floor, View, Wake-up service, Dining area, Kitchenware, Mosquito net, Towels/Sheets (extra fee), Wardrobe/Closet, Stovetop, Barbecue, Sea view, Garden view, Mountain view, Towels, Linen, Dining table, Children's high chair, Outdoor furniture Can you tell us what you'd like to see here? This air-conditioned suite includes a bedroom, a living room with a satellite TV and a minibar and a private bathroom. It also offers a balcony. Room facilities: Minibar, Shower, Safety Deposit Box, TV, Telephone, Air conditioning, Hairdryer, Balcony, Seating Area, Free toiletries, Toilet, Bathroom, Heating, Slippers, Satellite Channels, Private entrance, Sofa, Tile/Marble floor, View, Wake-up service, Mosquito net, Wardrobe/Closet, Towels, Linen Can you tell us what you'd like to see here? Geçen yaz kaldığımız afrodit tatil köyü zeytin ormanı içerisinde yer alan özellikle çocuklu ailelerin çok rahat edebilecekleri bir ortam sunuyor. Personel oldukça ilgili ve güleryüzlü. Organik ürünlerden oluşan mutfağından ve zeytinyağlı mezelerinden özellikle çok memnun kaldık. Hatta aynı işletmenin yeni yapmış olduğu Aeneas butik otele de sonbahar ayında gittik; butik otel ayrıcalığını yaşamak isteyenlere özellikle tavsiye ederim. Herşey çok güzeldi :). Please note that early check-in and late check-out is available depending on availability.